Jan's Tip: To make a large batch, save your peels in a ziplock bag in the refrigerator till you have the amount saved that you want or store in freezer (thaw before drying them). I am using a dehydrator but will also give you oven drying directions. Scrap as much of the white pith from the under side of the peels as you can. Lay your peels on dehydrating tray leaving space in between the peels for air to flow. Dry at low setting (if your dryer has settings, mine does not) for anywhere from 5-8 hours approximately Some dryers may take longer. You are looking for them to be crispy and snap when you bend them. From here you can break them into pieces or grind them in a blender into powder. Store in airtight containers. Store in cool spot, (I actually just store them in a jar in my freezer door and pull it out when I need some. Preheat oven to 200 degree's. 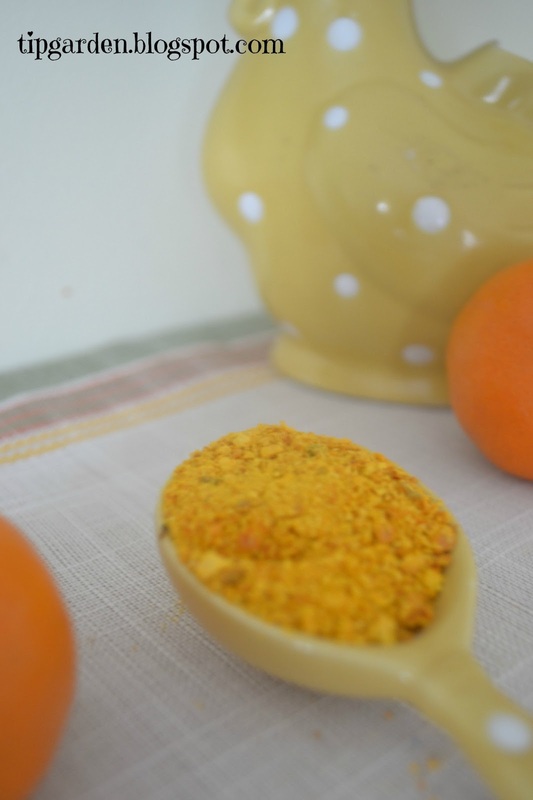 Scrap as much of the white pith from the underside of the peels as you can. Lay your peels peel side down on baking sheets. Bake 3 hours, checking them every 20 minutes or so to make sure they don't burn. At the 3 hour mark simply turn off the oven and let them continue drying overnight. They should be crisp and snap when you bend them. I don't drink tea, but found a fun recipe over at nourshingdays.com for a caffeine free orange spice herbal tea mix. I think this would make a great gift for a friend either during the holidays or a birthday with a pretty vintage tea cup and making your own honey lemon spoons out of vintage teaspoons. 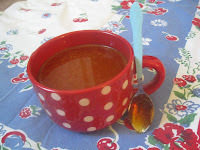 My Caffeine Free Orange Russian Tea Mix with Honey Lemon Toffee Stir in spoons.